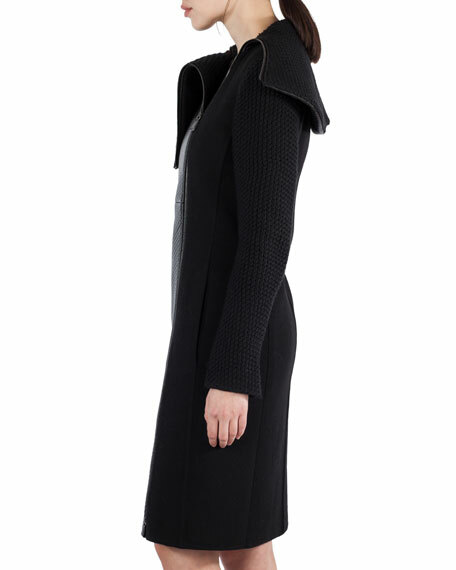 Akris coat in textured wool-blend and napa lambskin leather. From the Fall 2017 Ready-to-Wear Collection. Funnel neckline; double zippers at front with two-way closure. This family-owned Swiss house is guided by Creative Director Albert Kriemler. His grandmother launched the line in 1922 and drew the name from her own initials (Alice Kriemler Schoch). Today the company has earned a reputation for exceptionally well-tailored dresses, suits and separates, and each piece is still designed in Switzerland. For in-store inquiries, use sku #2202781.